These skewers can be served at room temperature or quickly grilled, but mind the goats’ cheese, as it will melt if left too long on the heat of the barbecue. The day before you want to serve this dish, preheat the oven to 230˚C/gas mark 8. Place the whole peppers on a roasting tray and transfer to the oven. Roast for 20 minutes or so, until the skin blackens and the peppers are starting to collapse. Remove from the oven and place in a large bowl while hot. Cover tightly with cling film and leave to cool for 2 hours. Peel off the skin and cut the peppers into long strips about 3cm wide. Lay them all in a large ceramic dish and drizzle with the olive oil, scatter over the thyme and season well with salt and pepper. Cover the dish with cling film and marinate in the fridge overnight. The next day, preheat the barbecue to a very high heat. Soak eight small wooden skewers in cold water. 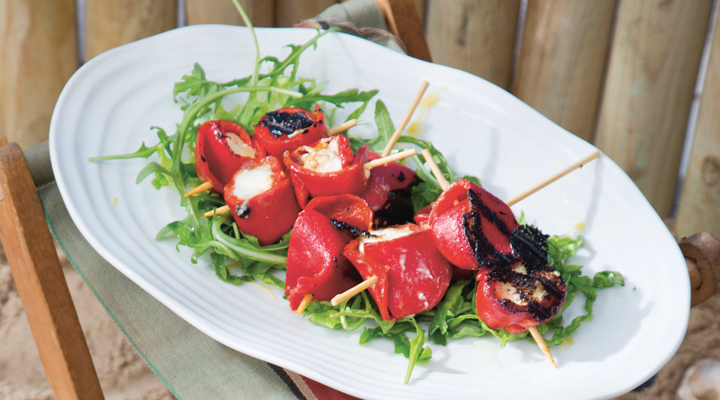 Wrap a pepper strip around each ball of goat’s cheese, then thread two or three stuffed peppers onto each skewer. Place the skewers on the barbecue for 1 minute to warm up. Don’t leave them too long or the goats’ cheese will melt into the barbie!